Fifteen years ago or so I was invited to give a lecture at a rod and gun club on Whidbey Island. Since I always liked to fish I was at least half in sympathy with the club’s program and so agreed to attend. It also helped that the manager was a relative.One of the islanders who attended the show was a retired real estate salesman who had worked most of his selling life in Seattle. He brought me the gift of this 1912 Baist Real Estate Map, and it was surely one of the finest gifts I have ever received and most useful too. Although clearly used and sometimes improvised with penciled additions, the 1912 Baist is at this writing (in 2010) nearly a century old and still in good shape – except for the index. That was curled and creased and even torn in places – not that it matters much. The index is an overall map of the city on which 34 sections are given marked boundaries and numbered within. It is those 34 sections that are treated individually with their own maps. Those are still clear, and that is what matters. All 34 plates are wonderfully hand-colored and detailed with information like additions that are distinguished by contrasting colors, numbered blocks and within those blocks numbered lots (and often that is all you need to get going with your research). The maps also show footprints of structures, color-coding for types of construction, lines for utilities, and more. Many of us are simply in love with maps. For us the cheap thrills of hand-wrought cartography can keep us insensitive to the neighbor’s poodle barking at 3 A.M. Also with this gift of a Baist at your side it may no longer be necessary to drive to the library. Although that is not ordinarily an unpleasant journey it does take time. And parking “tokens” that fold or require signatures add up. And here we note and make a plea. If you should like to share a photo of your house or some other part of historical Seattle that can be included then send your scans to Ron at edge_clippings@comcast.net. With few exceptions he will use them on one of the 34 Baist plates – the proper one and in the proper place. So please be pointed about what plate and where on it. It is Ron who will also first field and interpret your recommendations and complaints. How can one complain about a century old map? Turn or click to Plate #4. There from top to bottom – between Yesler Way and Union Street and about two blocks west of Broadway Ave. – the plate has been frayed or torn. But for all the blocks this mutilation touches only one of them ruinously. Block 61 of Terry’s 2nd Addition, between 7th and 8th Avenues and Spruce and Alder Streets, cannot be read. The information in the remaining torn blocks can generally be inferred. On two plates users have attempted to sketch in the curves of new city streets that were cut through the printed grid of those plates. One for E. Olive Way is on Plate 7, and the other, a real impressionistic whopper, is for the long and curving western end of West Seattle Bridge where it climbs the West Seattle ridge. You will find that scribble on Plate 28. All the rest of these 34 maps is left to search and enjoy – like the original serpentine course of the Duwamish River (plate 29), the tidelands of Interbay (plate 21), and the place of Foster Island before Union Bay, as part of Lake Washington, was lowered about nine feet for the ship canal in 1916, or four years after these plates were first published. Next Ron explains – with illustrations – the “technical story” behind this Baist unfolding. The first major decision in digitizing Paul’s 1912 Baist’s Real Estate Atlas was to remove all the 24” by 34” Plates from the bound hardcover book that held them. This allowed complete access to each of the maps. The copy station design and photographic process evolved over a 2 or 3 month period. In the final process I used a large flat board made from Pergo flooring material to attach the index map and each of Baist’s 34 linen plates. 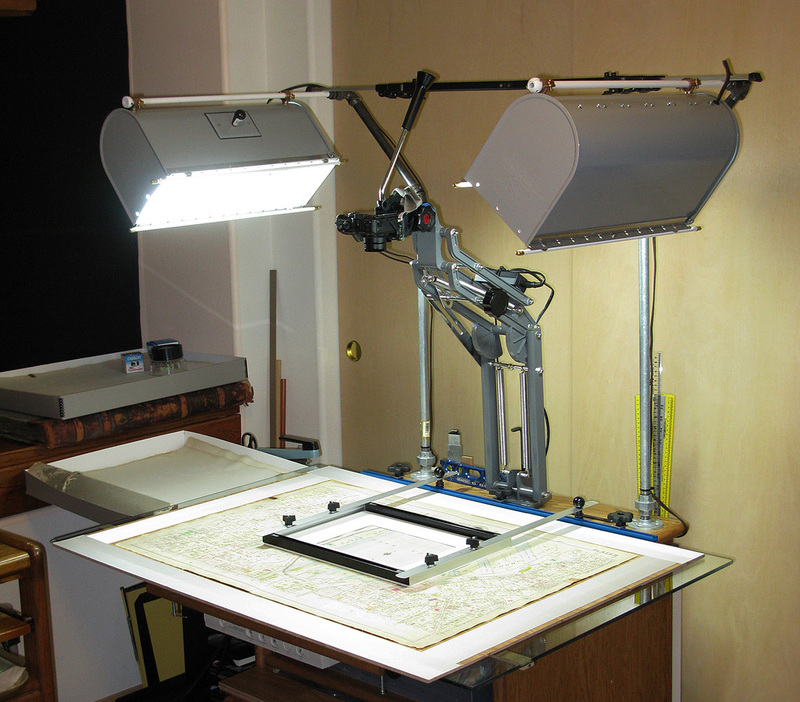 The hard flat surface allowed me to stretch and aligned each map using double stick tape. After experimenting with camera settings, lighting and image overlap, I settled on taking 42 digital pictures of each map in sections 4.25″ by 5″. 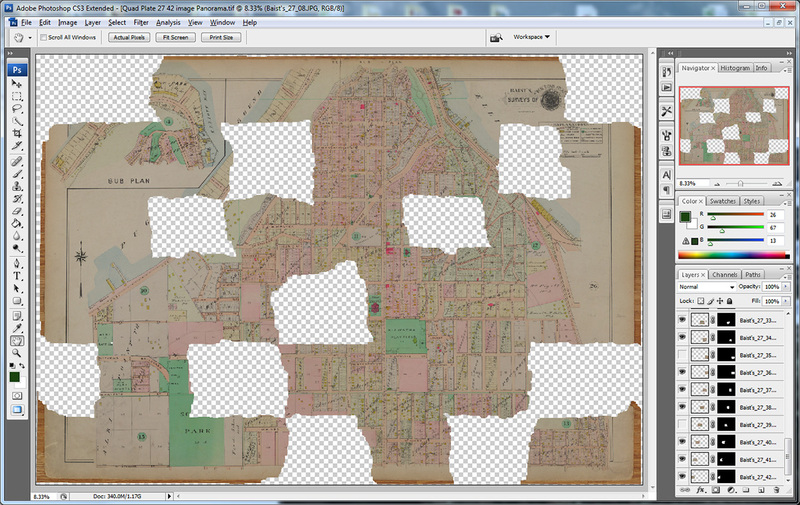 I built a target frame and laid out a grid so I could record 7 pictures across the length in 6 passes of each map. I used my Canon G10 camera controlled remotely from my computer. The 42 images were hand cropped and loaded into Photoshop where they were merged into one image. 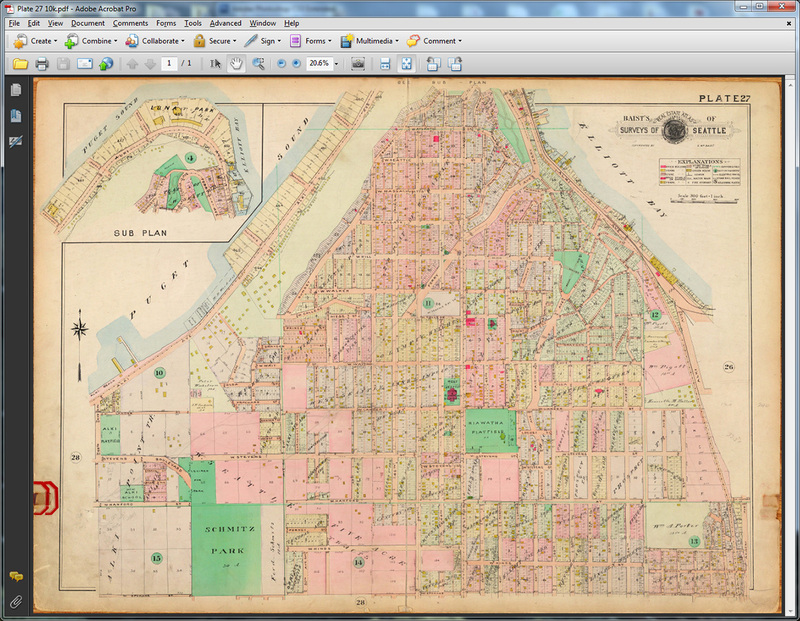 The full map images were then aligned, color adjusted and then converted into PDF format for the web viewer’s pleasure. In order to provide good detail and readability the size of the PDF files for each map are rather large and may require some time to open based on your cpmputer and internet access speed. Once opened these maps can be saved to your computer. As pictures and information are linked to each of the maps as Paul described above they will be updated on the web. Previous PostOur Daily Sykes #198 – Tis The Season SomewhereNext PostOur Daily Sykes #199 – "A Promise of Spring"
Beautiful! Looking forward to these scans. Beautiful! Thanks for doing this. Wish we had an actual map like this in our home. We have made use of David Rumsey’s fine online maps such as this one from 1890 to help us locate a house on Queen Anne, where so many of the named streets now have numbers and the numbered streets names. If you fuss around a bit can zoom in and drag the map around. I don’t think you need look forward – no mor’ They are up. Thanks for the link. Maps surely are a delight and helpful too. Amazing project and great job! They really are beautiful. Thanx so very much for this laborious gift to us and our posterity. MUCH appreciated!!! Will pass it on to some of our old LC classmates. I’m looking forward to contributing photos. Silly me — I didn’t realize the image was a link. Wonderful resource. Thank you, Paul! Thanks so much for this. So nice not to have to trek down to the Central Library every time I need access to anything of the sort. Paul, this IS a gift. Thank you so much for posting this. I can’t wait to dig through it! Beautiful. Excellent. Wonderful. A lot of fun. Thank-you for the effort. Good Lord!! What a great endeavor! Think you all so much. Great job Paul. I wish Cerelli was alive to see it. I always knew you’d make good someday. On second thought, I recall the old Sears Roebuck catalogs which graded many products as either “Good-Better-Best”. Forget the Good, you’re truly the Best. Thanks so much for a superb resource, some of my dreams are now realized. This is the coolest thing! What a wonderful gift to fans of Seattle history! Thank you, thank you, thank you!!! Thank you very much. I’ve spent the day attempting to research the history of our house. This shows that our house had drastic changes made to it between 1912 and 1923. I love maps–and this is a great one! Thanks to all of you for posting it! Descendents of Seattle’s earlier populace will have fun locating family addresses from long ago. If old photos can be located (and matched to the plat number) I’ll send them your way. Many thanks to you for this wonderful project. Mr Dorpat- your team has done a stellar job in providing a view into seattle’s history. I find maps to be very interesting and educational. Thank you for a job well done- to you, Jean, Rick, and anyone that I missed. Truly amazing. Thanks so much for doing this amazing work. I have been searching though the documents all day. It’s fascinating to look back to 1912 and see what was here. This is a pure treasure. Thanks so much for the gift. Having grown-up around the corner from the Dressler Buick dealership at 42nd and Roosevelt and the family home now a parking lot, it was interesting to see the house footprint, as it appeared in 1912. My only wish is to have a Assessor’s photo of the house at 906 N.E. 42nd. Where can this Seattle native locate an old Assessor picture of this vacated property? They have a photograph of all properties in the county, taken between 1930-1940. There’s also Side Sewer cards at http://web1.seattle.gov/dpd/sidesewercardsv2/ which has interesting information as well. Why is the street so wide for 1/2 a block at the corner of Harvard Ave. E. and Thomas St. on Capitol Hill? It’s clearly visible on this map and I think it is there on the c1890s map linked in the comments. Glad to see my grandfather’s maps are still being enjoyed. Hey Paul – thanks for sharing, and keeping up the good work! The process is fascinating, and the results amazing!